Every now and then an unusual situation pops up. The chimney/shade holder pictured below is rather unique in that the groove into which the shade fits (see the black arrow) is quite narrow. 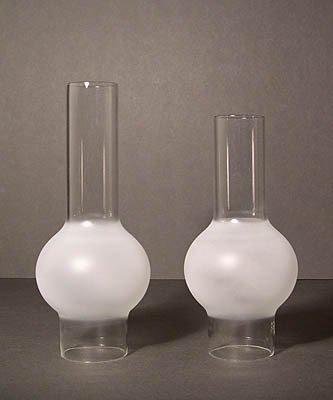 In a situation such as this it will likely be necessary to blow shades with custom-sized fitters and in order to assure a proper fit it will be necessary for the glassblower to have the holders on hand to check fit as the shades are blown. If you should have a shade holder that is similar to this, when you place your order, please be sure to bring it to our attention so that we can avoid unnecessary delays and expenses. The profile of this reproduction Argand Trumpet shade pictured above with an inside frost has been copied from that of a period shade. It is 8-5/8" high, the top diameter is 5-15/16", the bulge measures 4-9/16", and the fitter measures 2-9/16". 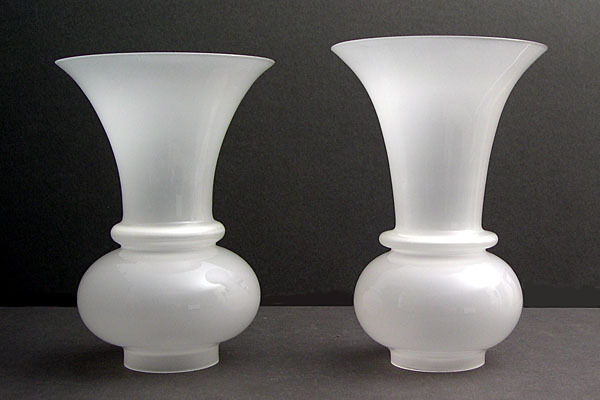 This photograph compares the Argand Trumpet Shade II (described below) on the left and the Argand Trumpet Shade I (described above) on the right. The major differences are: Shade I is taller than Shade II, the large bulge on Shade II is not as bulbous as that on Shade I, and the shape of the small bulge on Shade II is less severe than that on Shade I. 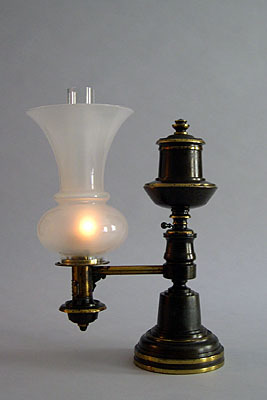 The profile of each shade has been copied from that of period shades. This trumpet shade is quite similar to the preceding Argand shade. You will notice that the large bulge is slightly flatter and that there is also a bit of a difference in the shape of the small bulge. 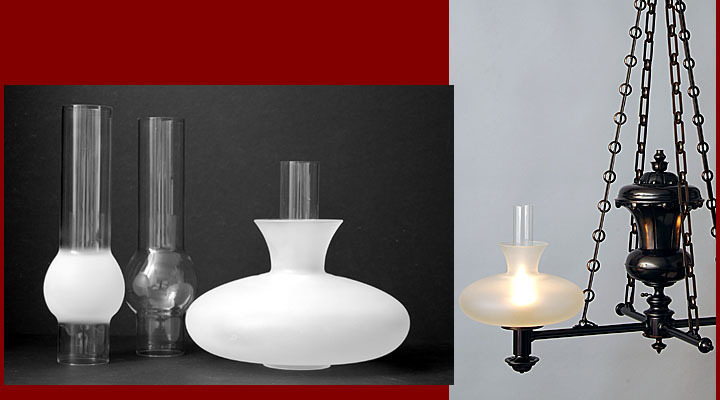 Slightly shorter in height, you many find it to be more appropriate for use on lamps that might be a bit too small to accommodate the Argand Trumpet Shade I. 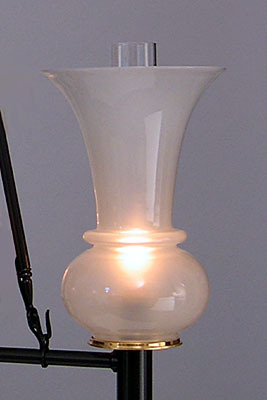 This shade is 8-1/4 tall and the diameter of the flair at the top is 5-7/8. The fitter has a maximum outside diameter of 2-5/8 and a minimum inside diameter of 2-3/8. The shade pictured above is frosted on the inside. 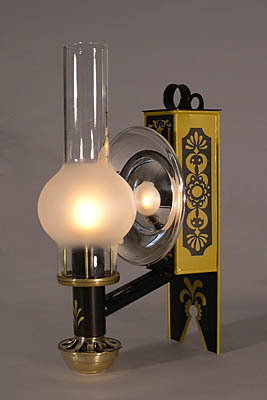 Once again we have chosen to reproduce a shade profile pictured in 19th Century Elegant Lighting by Gerald T. Gowitt. 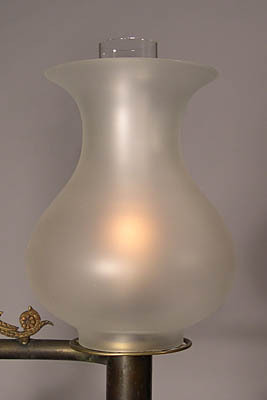 This graceful shade is on page 198 and measures 6-3/4 in height and 5-3/16 at the widest part of the bulge. The fitter has a maximum outside diameter of 2-5/8 and a minimum inside diameter of 2-3/8. The shade pictured above is frosted on the outside. The profile of this shade has been faithfully reproduced from that of a period shade. Similar in style to the Vase shade, it has a slimmer appearance that will help round out the size range of our selection of shades. The height is 6-13/16", the diameter at the top is 3-3/4", and the diameter of the bulge is 4-5/8". The fitter has a maximum outside diameter of 2-5/8" and a minimum inside diameter of 2-3/8". 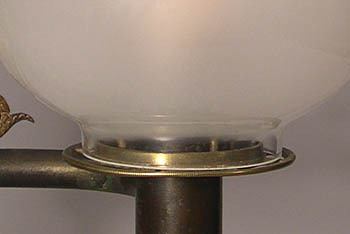 The shade is pictured with outside frosting and a clear fitter. 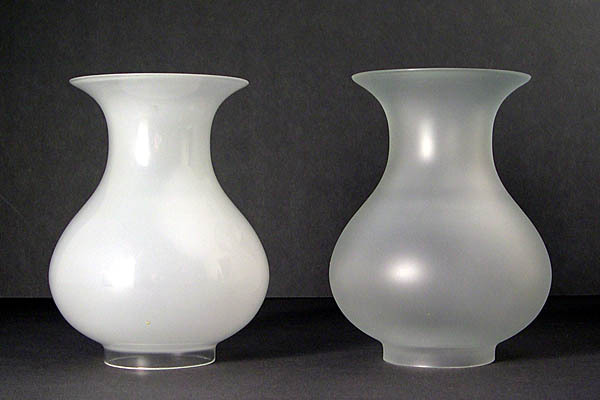 This shade is of medium size and is ideal for use on lamps that require a shade that is larger than the vase shade but smaller than either of the trumpet shades. The lines are most graceful and the solid rim at the top is clear. 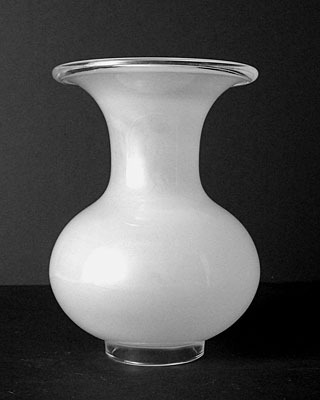 The height is 7-5/8", the diameter at the top is 5-1/2", and the diameter of the bulge is 5-5/8". The fitter has a maximum outside diameter of 2-5/8" and a minimum inside diameter of 2-3/8". The shade is pictured with inside frosting. 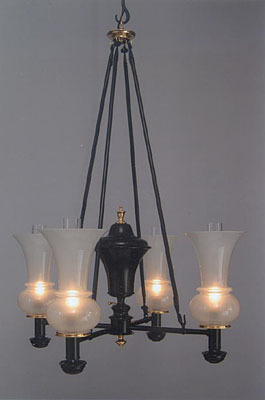 This shade was designed to be used on lamps that had a chimney holder that did not accommodate a shade. 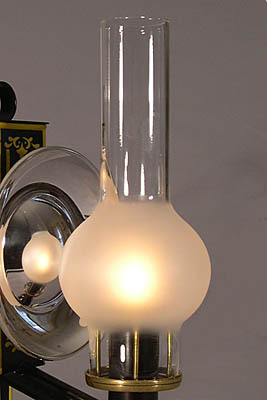 It is a nice alternative to be used on more stylish lamps that might benefit from a more fashionable chimney. The fitter is identical in size to that of the Argand chimneys and the chimney/shade can be furnished with a custom height to suit your needs. 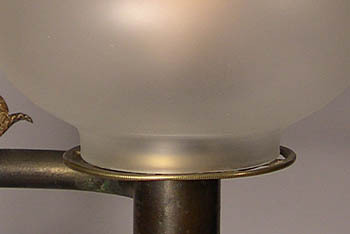 The shade on the lamp above measures 8 in height; the photo below shows both the 8 shade as well as a 7 shade. 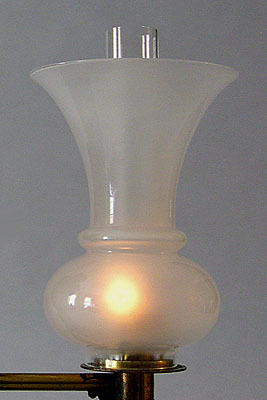 The profile of this shade was copied from the chimney on the lamp on page 179 in 19th Century Elegant Lighting by Gerald T. Gowitt. This shade and chimney were developed for use on two custom designed chandeliers that I made for the restoration of the Separate Prison located in Tasmania, Australia. 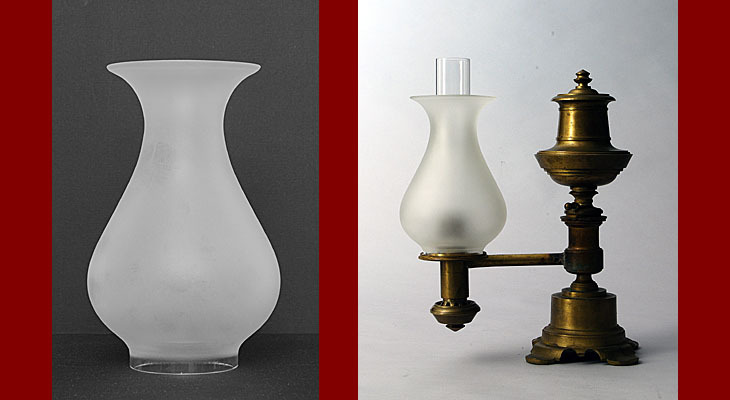 While the shape of the shade is unusual there are images of period shades with similar profiles. The Separate Prison is part of the Port Arthur Historic Site. This prison complex was constructed in the early 1800's; the Separate Prison was built in the early 1850's. The shape of the building resembles that of a wheel; the 'hub' was referred to as the central hall and three of the four 'spokes' are corridors lined with cells. The fourth spoke houses a chapel. Three sketches of the interior still survive and these along with documents that are in the Site's archives were used to reconstruct the two-burner hanging fixtures and 7 cell fixtures. Finding a model to recreate the font on the hanging fixtures was one of the biggest challenges; severe time constraints required using a font for casting purposes that was similar but not nearly identical to the font as depicted in the sketches. The hanging fixtures were described as 'solar' but the construction as shown in the sketches resembled that of Argand fixtures. 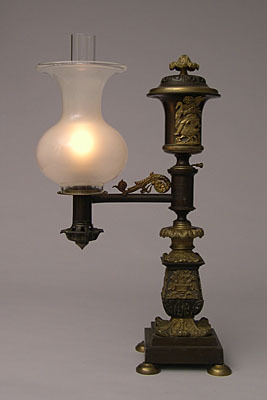 It is thought that oxydators or the Smith & Son converter may have been used to up-grade the Argand fixtures to solars. 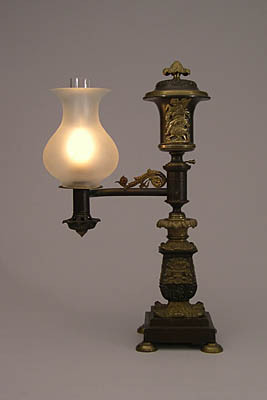 Solar bracket lamps were used to illuminate each cell - this seems to be a rather extravagant form of lighting for this use until one considers that prisoners preformed a great deal of handwork during the endless hours that they were confined to their cells. 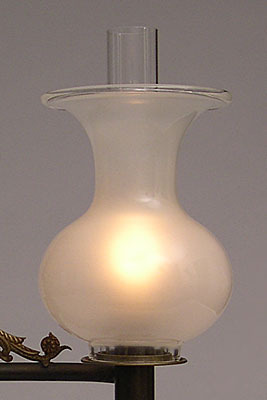 The shade has a standard Argand 2-5/8"fitter; the height is 5-3/4" and the diameter of the bulge is 8-1/2". As with other shades, if necessary the fitter size can be sized to fit your particular shade holder. This shade is available frosted on the outside only. Click HERE for more information & images about the Separate Prison.